This event was one of many throughout the state of Hawaii during National Drive Electric Week. Other events around the state hosted vehicles and ride-and-drives. This event was targeted for a broader, diverse audience to draw attention to electric vehicles and NDEW. An EV booth was at the University of Hawaii football providing EV education and giveaways. An EV commercial played during the game with an audience of over 23,000. The budget was split amongst other marketing campaigns so direct cost of this event was relatively small. University of Hawaii football fans get excited about electric vehicles. 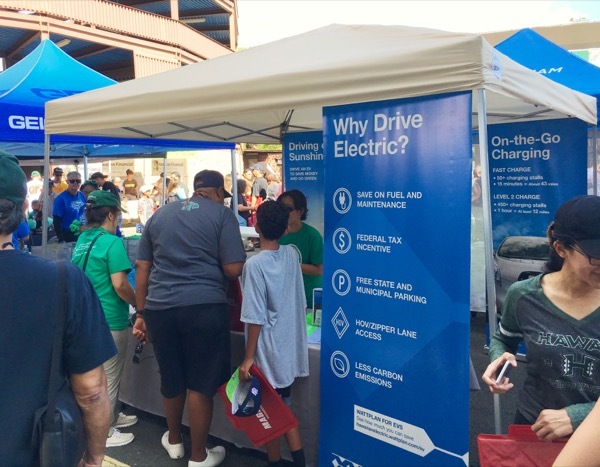 Come learn about electric vehicles and how to charge them at the Vendor Village before the University of Hawaii vs Rice football game.